One of the big questions when DDR4 was launched was around the comparison to DDR3. Was it better, was it worse? DDR4 by default switches down to an operating voltage of 1.2 volts from 1.5 volts, making it more power efficient, and the standard increases the maximum capacity on an unbuffered memory module. There are also some other enhancements such as per-IC voltage drop control and a design to aid DRAM placement in motherboards. But there was one big scary number – a CAS Latency of 15 (known as C15 or CL15). Let’s do a quick memory recap on frequency (technically, transfer rate but used interchangeably for this purpose) against latency. The CAS latency is the number of clocks taken between an access request from the memory controller to actually acting on that request. So a CL of 15 means that there are 15 clocks between that request and getting access. Generally, a lower CL is better. The Frequency is the rate at which those clocks occur. DDR stands for Double Data Rate, which means that in one hertz in the frequency there are two requests – one each on the rise and fall of the clock signal. The reciprocal of the frequency/transfer rate (one divided by the frequency) is the time taken to perform a clock. In fact despite the development of new memory interfaces, the true latency for DRAM under default specifications has stayed roughly the same since DDR. As we make faster memory modules, the CAS Latency rises to keep higher frequency memory stable, but overall the true latency stays the same. As you have faster memory, you get a bigger number, and if you reduce the CL, we get a bigger number also. Thus for comparing memory kits, if the difference > 10, then the kit with the biggest performance index tends to win out, though for similar kits the one with the highest frequency is preferred. In the grand scheme of things, a PI of 207 is actually quite large, and super high for DDR3L. There are a few DDR3 memory kits that go beyond this up to a PI of 220, or an overclock might go to 240 beyond normal voltages, but a value of 207 shows the maturity of the DDR3 market. If we look at the current DDR4 market, we can pick up kits with DDR4-3000 C15 ratings, which are similarly in the 200 bracket now too. I’ve prefaced our DDR3L vs DDR4 testing with all this as a response to ‘large CL = bad’. Actually, you have to compare both numbers. Now that we have a platform that runs both, and we were able to source a beta DDR3L/DDR4 combination motherboard to test them on, we can see how it squares up from ‘regular DDR4’ against ‘high performance DDR3(L)’. For these tests, both sets of numbers were run at 3.0 GHz with hyperthreading disabled. Memory speeds were DDR4-2133 C15 and DDR3-1866 C9 respectively. Cinebench is a benchmark based around Cinema 4D, and is fairly well known among enthusiasts for stressing the CPU for a provided workload. Results are given as a score, where higher is better. 3DPM is a self-penned benchmark, taking basic 3D movement algorithms used in Brownian Motion simulations and testing them for speed. High floating point performance, MHz and IPC wins in the single thread version, whereas the multithread version has to handle the threads and loves more cores. For a brief explanation of the platform agnostic coding behind this benchmark, see my forum post here. Our WinRAR test from 2013 is updated to the latest version of WinRAR at the start of 2014. We compress a set of 2867 files across 320 folders totaling 1.52 GB in size – 95% of these files are small typical website files, and the rest (90% of the size) are small 30 second 720p videos. Similarly to WinRAR, the FastStone test us updated for 2014 to the latest version. FastStone is the program I use to perform quick or bulk actions on images, such as resizing, adjusting for color and cropping. In our test we take a series of 170 images in various sizes and formats and convert them all into 640x480 .gif files, maintaining the aspect ratio. FastStone does not use multithreading for this test, and thus single threaded performance is often the winner. Handbrake is a media conversion tool that was initially designed to help DVD ISOs and Video CDs into more common video formats. The principle today is still the same, primarily as an output for H.264 + AAC/MP3 audio within an MKV container. In our test we use the same videos as in the Xilisoft test, and results are given in frames per second. The Persistence of Vision RayTracer, or PovRay, is a freeware package for as the name suggests, ray tracing. It is a pure renderer, rather than modeling software, but the latest beta version contains a handy benchmark for stressing all processing threads on a platform. We have been using this test in motherboard reviews to test memory stability at various CPU speeds to good effect – if it passes the test, the IMC in the CPU is stable for a given CPU speed. As a CPU test, it runs for approximately 2-3 minutes on high end platforms. As an open source compression tool, 7-Zip is a popular tool for making sets of files easier to handle and transfer. The software offers up its own benchmark, to which we report the result. 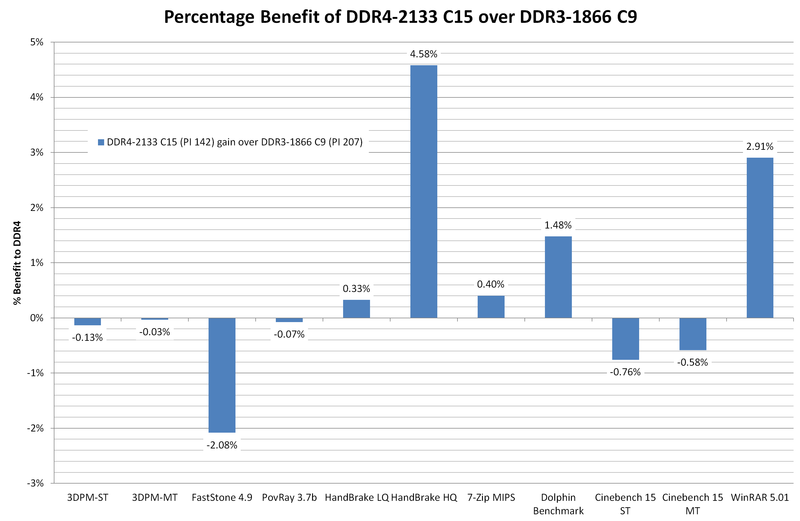 Comparing default DDR4 to a high performance DDR3 memory kit is almost an equal contest. Having the faster frequency helps for large frame video encoding (HandBrake HQ) as well as WinRAR which is normally memory intensive. The only real benchmark loss was FastStone, which regressed by one second (out of 48 seconds). End result, looking at the CPU test scores, is that upgrading to DDR4 doesn’t degrade performance from your high end DRAM kit, and you get the added benefit of future upgrades, faster speeds, lower power consumption due to the lower voltage and higher density modules.